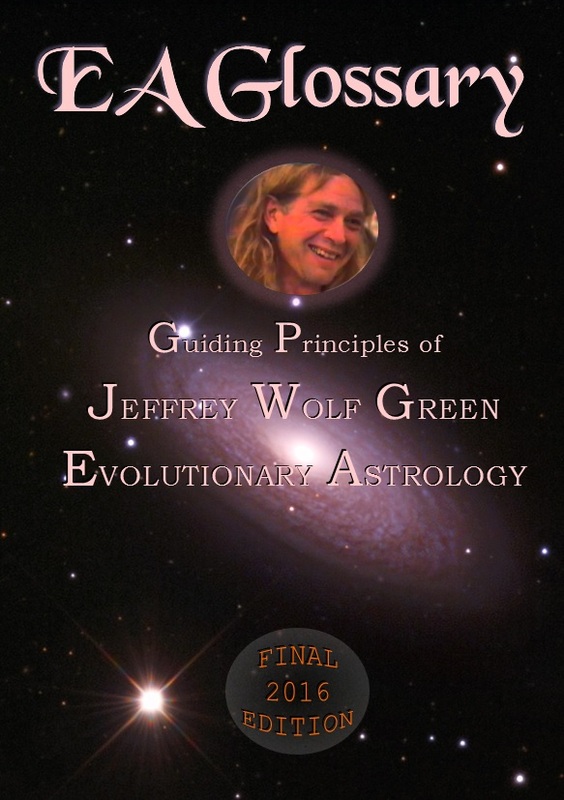 Incredible EA information, knowledge, wisdom and insight is skillfully woven into this 4th and Final Edition, condensing Jeffrey Wolf Green’s four decades of world-renowned Pluto work into bite-sized info-packets. Compiled from extracts from the message board of The School of Evolutionary Astrology from March 2009 to December 2015, the EA Glossary provides indispensable study material for resourceful EA students and discerning members of the astrological community, in essence serving as a compass to help navigate into the depths of EA. The EA Glossary contains well-organized chapters, subsections, tables, figures, commentary, Q & A’s, examples, EA archetypes, links to all EA practice charts, links to old message board transcripts, and links to Jeffrey Wolf Green Lectures, all interspersed with beautiful astrophotography of the universe. Contents are listed in a clear, concise and easy to navigate hyperlink format that marks the way along the Glossary’s borders and into its depths allowing quick access to information, promptly revealing answers to questions, and directing the reader towards personal discoveries long hidden from traditional astrology. The Pluto, Lunar Nodes and Skipped Steps chapters encompassing the powerful and penetrating Pluto paradigm contain a myriad of aspect combinations. The Astrologer/Client Relationship, EA Chart Interpretation and General Astrology chapters will assist aspiring EA students in formulating accurate in-depth EA chart readings. The Soul, God/Goddess – Spiritual Practice, and Natural Law chapters will reveal some of Jeffrey Wolf Green’s most precious and profound teachings. Download the Natural Law sample chapter and the Table of Contents for a glimpse into the Glossary’s contents. Order your copy of the EA Glossary today and align with the truth of your Soul as the students and teachers of the School of Evolutionary Astrology whisk you off to an astrological landscape filled with penetrating depth, insight, and revelation! Click the link below to download your order. When you click “the link below”, your Glossary PDF file will either download or else open in your web browser, depending on how your computer is configured. If the PDF file opens in your browser, it is important to save the open PDF file to your computer’s hard drive as the link in the confirmation email expires 4 days after the purchase date. Once the PDF file is saved on your computer you have access to it at all times. When a PDF file is displayed in a browser, there is a browser button to click that saves the open PDF file to the computer’s hard drive. If you need assistance with downloading the file, or if the download link has expired, please contact us for assistance. Thank you for purchasing the EA Glossary. We hope you find much value in it!